This lesson describes how to create an Invitation for an IEP meeting, indicate its purpose, and determine the setting (i.e. location, date, time). To create an Invitation click on Special Ed-> IEP Details-> Add Invitation. 1. Indicate whether the purpose of the IEP is to determine eligibility by selecting the Check Box. 2. If the purpose of the IEP meeting is to determine eligibility, indicate the type of determination (i.e. Initial, Redetermination, Transfer). 3. 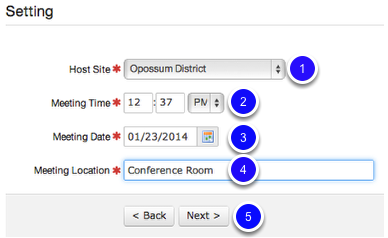 Select additional IEP meeting purposes by clicking on the appropriate Check Box (i.e. review/revise, program/level change, transition plan, etc.). 4. A field is provided to type additional purpose(s) for the IEP meeting which may not listed. After clicking Save, you are ready to add Invited Participants. Clicking Save will automatically take you to the Invited Participants page. For more information on how to add Invited Participants, see the "Add IEP Participants" lesson in this manual. Note: Once you have clicked Save, a green dialogue box indicating IEP Wizard Invitation saved successfully will appear at the top of the Invited Participants page.